What a magical heap of Navajo horseshit! I knew Windtalkers wasn't a very good movie long before it showed up at my door. It was my hope that I could look at Windtalkers not as a drama set during World War 2, but as a Saving Private Ryan ripoff, but my hope was, as a John Woo fan, that I might enjoy Windtalkers on a different level. I wasn't able to. Windtalkers isn't really bad cinema, but I can't recommend it to anyone, John Woo fan or not. Windtalkers isn't a good movie. I like John Woo movies, even Spielberg make the feel-bad war movies. There is one good thing about Windtalkers, and that is the hellish ghoul role of Face Off. Unfortunately, the role alone was not enough to carry the rest of the movie. The DVD of Windtalkers includes a 16x9 enhanced 2.35 to 1 picture and a Dolby Digital 5.1 soundtrack that does well with the vast amount of explosions, gunfire, explosions, screaming death throws, explosions, and explosions. There were no special features worth mentioning and no DTS soundtrack. It would seem they spent as much time on this DVD as they did on the movie, not much. 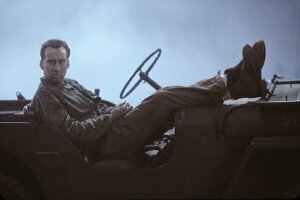 Windtalkers is another reason to take John Woo off of the cool directors list. While it would be difficult to make an action movie set in the bloodbath of World War 2, it would have been a better use of his talent and a more entertaining movie. As it stands right now there are hundreds of war movies worth watching and re-watching instead of this one. Grab a copy of Tora Tora Tora instead.